I just stumbled upon this picture of the Gaziano & Girling ‘Gable’ model and could not help but be enamored with it. I was never that fond of the ‘Gable’ model in it’s stock color of dark brown and on G&G’s ever popular TG73 last (the chisel toe). However, after seeing it in this lovely shade of green on the DG70 last (my favorite one), I have now come to look at it in a new light. A good green shade is hard to execute. Too dark and you don’t get to appreciate it for what it is. Too light and it becomes ostentatious. It’s also one of those colors that inevitably has to be given a slight patina to it, shading it with a bit of black and thus giving it depth. Because it if is just a flat shade, it looks quite awful. Here they have done a brilliant job by subtly deepening it without completely drowning the color of its luster. And when executed properly like this, green becomes a shade that for me, can be paired with many other colors, including most that we all wear suits in…. 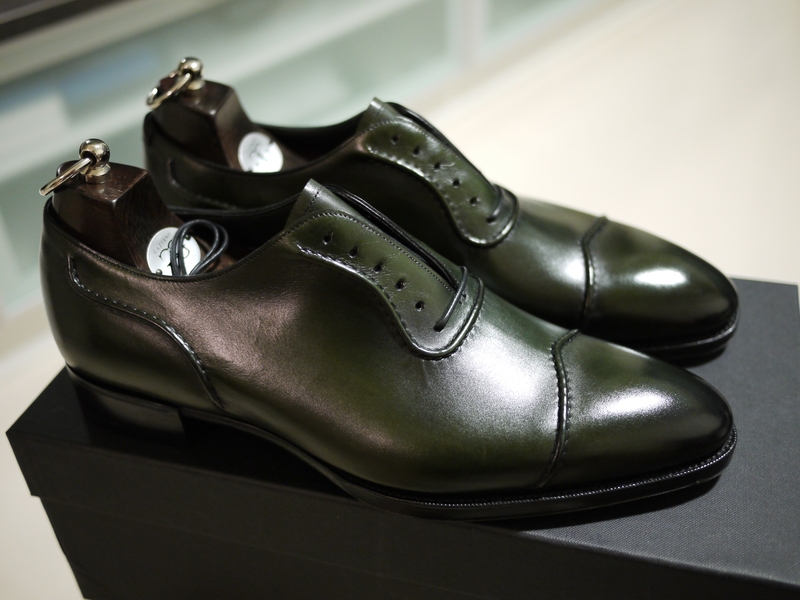 There aren’t many green shoes that I’d consider pairing with a suit, but these beauties, absolutely. Wore my green Lobbs today. Got my British racing green G&G Montand IIs (ordered back in July) arriving in November. I have a pair of EG in vintage olive, my first pair of Green/green. Re. Gable, they are also cool in vintage cherry… Everything is vintage, am I ?